Motor Vehicle Homicide OUI Category Archives — Massachusetts DUI Lawyer Blog Published by Boston, Massachusetts Criminal & DUI/OUI Defense Attorney — Stephen Neyman, P.C. As a Massachusetts intoxicated driving criminal defense attorney, I was saddened to read about an accident in Lynn that took a young woman’s life. Julie Gauthier, 19 and of Salem, died March 21 while her allegedly drunk boyfriend was driving her home from a party. 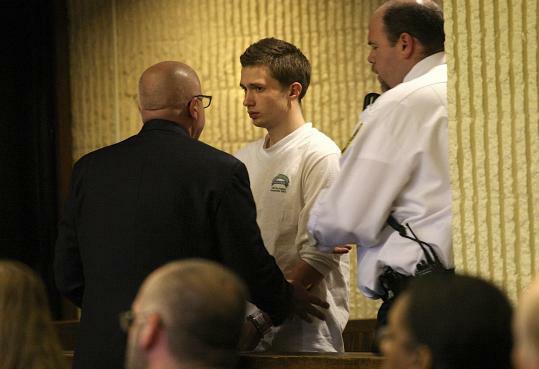 Christopher Maxson of Marblehead, also 19, is accused of drinking before he ran two stop signs, hit another vehicle and collided with three parked cars before overturning and hitting a fourth. Gauthier was ejected from the vehicle’s sunroof and died at the scene, while Maxson and two other passengers sustained only minor injuries. The Boston Globe reported March 23 that Maxson has pleaded not guilty to motor vehicle homicide while operating under the influence. Lynn police and school authorities highlighted the fatal accident when they began speaking to parents about the importance of safety during the school district’s upcoming proms. The Daily Item of Lynn reported March 31 that authorities held the first of three Parent Prom Safety Information Nights at Lynn Classical on March 25. Just four days after the crash, police officers emphasized that it could have happened to anyone — even kids who weren’t drinking or doing drugs. Police officers who spoke said prom is a time for students to make wise decisions, and emphasized the dangers of drinking and driving. But a local prosecutor also emphasized the Commonwealth’s “social host” laws. Enacted in 1998 after a fatal OUI accident, social host laws penalize people who provide alcohol to minors. In fact, the prosecutor said, parents don’t need to have bought the alcohol themselves, or even be home, to be criminally prosecuted for knowingly allowing kids to drink alcohol under their roofs. If convicted of furnishing alcohol to a minor, parents and others face up to a year in jail, a fine of up to $2,000 or both. And regardless of whether they are convicted, the presentation said, they can also be sued in civil court, an expensive and emotionally difficult prospect even if they win the case. As a Massachusetts OUI criminal defense lawyer, I’d like to discuss this law further, because it allows criminal prosecution in several situations that most people would not consider criminal. Parents are allowed to serve their own minor children alcohol in Massachusetts, but under the social host law, they may not furnish alcohol to other minors. Nor may they knowingly allow their minor children to furnish alcohol to other minors. The definition of “furnish” includes intentionally allowing someone under 21 to have alcohol on property under your control. An overzealous prosecutor could interpret this as allowing criminal charges for parents whose teenagers get into alcohol left in plain view, even when they didn’t expect or give permission for their kids to drink it. In cases where the parent can prove they didn’t provide the alcohol themselves, teenagers can still be criminally charged for giving alcohol to their friends. The social host law can be used even when there was no car crash or other harm from the drinking. That means parents can be criminally penalized for doing something that’s no big deal in most other Western nations — allowing a young adult to have a drink with dinner. As a Massachusetts drunk driving criminal defense attorney, I know very well that drinking and driving can have life-altering or even fatal consequences. As prom season approaches, teenagers and parents should remember that. But the social host law applies to any situation in which a minor under 21 is given alcohol — not just dangerous drunk-driving situations. Safe, responsible drinking by someone who just happens to be under 21 shouldn’t expose a teenager — or a parent — to a criminal record. One young man from Norwell is dead and another faces prison after a bad drunk driving accident, the Quincy Patriot Ledger reported March 9. Ryan O’Donnell, 18, was killed in a rollover crash in Norwell March 7. He was a passenger in a vehicle driven by a friend and former classmate, William Ecclestone, also 18 and from Norwell. Ecclestone is accused of being intoxicated when he drove his car into a tree, causing it to roll over. Ecclestone suffered minor injuries and was able to leave the vehicle on his own, but O’Donnell died at the hospital of his injuries. Police say Ecclestone showed signs of intoxication and failed a sobriety test. He is charged with motor vehicle manslaughter, vehicular homicide by negligent driving, OUI, reckless driving, speeding and leaving a marked lane. This terrible accident caught my attention, as a Massachusetts intoxicated driving defense attorney, because the crash was very serious, but also because the young men were friends who had graduated from the same small, close-knit high school. I was interested to see a related opinion piece written by another 2009 graduate of Norwell High School, Nicholas Russo, who is now at Lyndon State College in Vermont. Russo said the high school had staged a mock crash when they were seniors, which was “a carbon copy” of the one that took O’Donnell’s life. The students watched as firefighters worked to free students from the mock crash and took one away in a body bag, while the student’s father watched. Afterward, he said, students swore to an adviser that they couldn’t imagine driving drunk after seeing that. Russo suspected at the time that this was not true — and less than a year later, he has some evidence that he was right. Too many people think it can’t happen to them, he wrote. He ended the article by asking readers to remember that there are permanent consequences to driving drunk. As a Massachusetts OUI criminal defense lawyer, I’m afraid Russo is probably right. It doesn’t take a scientist to realize that people won’t stop doing something just because they know it’s not safe — for example, smoking. But there’s a second side to these mock crashes that students don’t see much of, and that’s the fact that drunk driving is a crime. Police officers may “arrest” the driver in the mock crash at the scene, but it’s difficult to drive home the seriousness of the consequences that driver would face. To do that, you have to think about the driver’s experience as he or she moves through the criminal justice system. In the crash that killed O’Donnell, Ecclestone is facing multiple charges. A charge of felony motor vehicle homicide carries up to 15 years in prison, with a mandatory minimum of 1 year. A charge of vehicular manslaughter with OUI, which is less common, carries a mandatory minimum of five years and up to 20. A conviction may also mean driver’s license revocation for life. His future plans may grind to a halt at the age of 18. All of this is on top of living with the knowledge that his actions are responsible for his friend’s death. If you’re facing charges this serious, you need to speak to an experienced Massachusetts drunk driving defense lawyer right away. A young man was arraigned for Feb. 8 driving drunk in an accident that killed another man, WCVB Boston reported. Prosecutors say David Diaz, 23, was drunk and asleep at the wheel when he hit Lay Bou, 56, on Route 110 in Methuen. Bou was jogging facing oncoming traffic, as was his habit, when Diaz hit him around 8:30 a.m. Bou was taken to the hospital, where he was pronounced dead. Diaz also suffered minor injuries and was taken to the hospital. There, a blood test showed he had a BAC of 0.16, twice the legal limit. Prosecutors say Diaz told police he doesn’t remember the crash, and accuse him of falling asleep at the wheel. According to the article, Diaz said he had left work around 3 a.m. and drank several beers at a friend’s house. At the arraignment, Diaz was charged with operating under the influence, felony motor vehicle homicide and failure to stay in his lane. He pleaded not guilty to all of the charges. The judge in the case ordered $10,000 bail, but said that if Diaz posts bail, conditions of his release include submitting to breathalyzer tests and giving up his passport. If he has not already done so Diaz must retain the services of a Massachusetts OUI defense attorney, because these are serious allegations. If convicted, he faces up to 15 years in prison on the felony motor vehicle homicide charge, plus potential jail time for the OUI charge as well. Importantly, however, the prosecution cannot convict on this charge simply by showing that the defendant was driving drunk when the fatal accident happened. In order to obtain a felony conviction, prosecutors must also show that the defendant was operating recklessly or negligently. This can be tough, because a lot depends on the circumstances of the crash and how well they are documented. If prosecutors can’t prove recklessness or negligence, they would have to reduce the charge down to misdemeanor motor vehicle homicide, which doesn’t require a recklessness showing. That charge carries up to two and a half years in prison, substantially less than the maximum of 15 for the felony charge. An experienced Massachusetts drunk driving criminal defense lawyer may also be able to challenge the blood test in court, if its validity, accuracy or chain of custody are suspect. Jonathan Muir is just twenty one years old and he has a tremendous legal battle ahead of him. Just over a week ago Muir was driving a 1984 sports car at around 1:30 a.m. Muir apparently lost control of the car and struck a tree. One of his three passengers was killed while two others were injured. Muir now stands charged with Motor Vehicle Homicide while OUI. Muir has also been charged with two counts of causing serious bodily injury while under the influence of alcohol and operating negligently so as to endanger. The article failed to report whether a blood alcohol reading was obtained from Muir. An article in Cape Cod Times reported that Muir too was injured and was taken to a hospital for treatment. It is probable that the hospital took a blood sample from Muir which is protocol for treating patients who are admitted. A toxicology work up would disclose Muir’s blood alcohol level, if any. The blood tests are the most accurate however they are fallible. I have blogged on this in the past. In scrutinizing blood tests criminal defense lawyers look for possible blood sample contamination. If contamination is demonstrated then we try to get a judge to exclude evidence of the defendant’s blood alcohol level. The issue of impairment can also be challenged if the blood readings are not consistent with the amount of alcohol consumed. Over the holiday weekend Jason Spurlin was driving with his girlfriend, Amanda Murray and two others, Anna Dubois and Nick Kelly. According to the police he was drunk and speeding. He lost control of his car around 1:15 in the morning, left the road and struck a tree. Spurlin survived but all passengers were killed. Apparently Murray and Spurlin have a five week old child together. Spurlin will now likely have to face three counts of Motor Vehicle Homicide. At least for now the case will be prosecuted in the Wrentham District Court. The biggest question raised by this article is how did the police determine that Spurlin was drunk at the time of the accident. There is no mention of a breathalyzer test or field sobriety tests nor is there any indication that there exist any witnesses to the accident. It is likely that if Spurlin was injured during the crash he was taken to the hospital. There, his blood might have been taken as is often the case when people get admitted to the hospital. While these tests are the most reliable forms of evaluating a person’s blood alcohol level they certainly are not infallible. Not all technicians are properly trained in taking the blood sample particularly in the case where they might be looking to test for alcohol. For instance, if yeast in introduced into the blood sample it might yield an inaccurate high false positive reading. Contaminated tubing can effect the reading. Improper labeling of the sample can be problematic. Swabbing with alcohol will often result in a high reading that lacks accuracy. If blood is the determining factor in Spurlin’s case there is no doubt that his attorney will scrutinize the process by which the blood was taken and analyzed.